PSNews - The People's Police Academy recently held a forum named "My stories - Your lessons" with the aim of raising awareness of police students when participating in traffic as well as building traffic culture, contributing to avoiding unexpected traffic accidents. 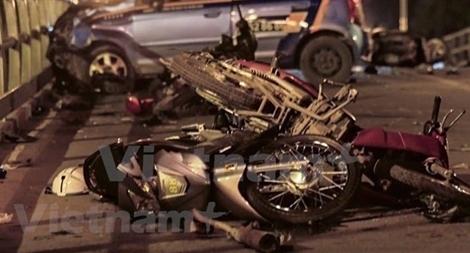 As many as 14,845 traffic accidents have been reported during the first 10 months of this year, killing 6,674 people, injuring 4,100 and slightly injuring 7,449 others, according to the General Statistics Office of Vietnam (GSO). The number of deaths and injuries caused by traffic accidents across the country reduced during the National Day holidays from the same period last year, according to the National Traffic Safety Committee (NTSC). PSNews – The Tay Ninh Provincial Police on January 6 held a conference to discuss measures to control traffic accidents as the province witnessed a large number of traffic accidents in December 2017, with 15 people dead, 18 others injured. PSNews - The Ministry of Transportation has approved to run the Ho Chi Minh City – Long Thanh – DauGiay Expressway since February 2015.